It is Thanksgiving in the United States this week. It is a time for turkey and pie. Oh the pies. I am thankful for many things, but I won’t go into many of those today. I want to talk about a Thanksgiving tradition. The Iron Bowl. The Iron Bowl is the annual American football game between my alma mater, Auburn University, and the other major school in the state of Alabama, the University of Alabama. While those facts would normally be enough to make the game interesting, when one realizes how little else there is to do in Alabama besides watch college football, it escalates. It is more than bragging rights. This year, Alabama is ranked number one and is the defending National Champion. Auburn is ranked fourth (out of 120 teams). The winner takes the division and will play in the the Southeastern Conference championship. As the SEC champion has won the last seven National Championships, In fact, the last four winners of the Iron Bowl have won the National Championship. There were many big games. The game was not played after 1907 for 41 years due to many disagreements. It was only after the Alabama State Legislature threatened to withhold funding from both schools that they resumed play in 1948. The first game wasn’t played in Auburn after the series restarted until 1989. Until then, it was played at “neutral” sites. It was an incredible game, and my first Iron Bowl. So many people showed up that the Auburn University sold out Beard-Eaves Coliseum, where the basketball team played, for people to watch the game on a big screen even though the game was being televised. Auburn beat the previously unbeaten Alabama 30-20. How big is the game? After losing to Auburn for the fourth year in a row in 1989, Alabama fired their coach, even though he had guided Alabama to their first SEC championship in eight years. This was the second Iron Bowl played at Auburn, and the first of the current home-and-home schedule. 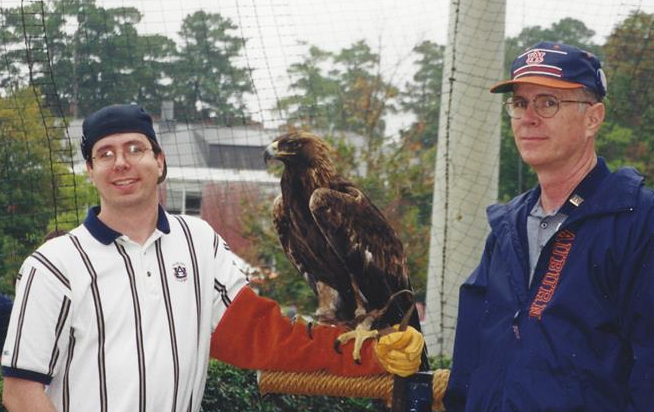 It was also my final Auburn football game as a student. To say it was a big game is an understatement. Auburn was 10-0 and Alabama was the defending National Champion. People started arriving at the game the Sunday before the Saturday match-up. They would likely have arrived sooner but many had likely spent the previous day watching Auburn beat Georgia over in Athens, GA. It was a mid-afternoon game, but we were all up early to park cars. We had a mini-tailgate going as we directed fans to parking spots. When the lot was full, we made our way into the stadium to sit with friends. Auburn was behind when our quarter back, Stan White, left the game with an injury. On the next play, our backup QB, Patrick Nix, through a touchdown pass. Auburn would complete the comeback to win 22-14. Auburn was on probation that year and the game wasn’t available on the television. The University of Alabama sold out the over 44,000 seats for their stadium so people could watch the game on closed-circuit television. Fans of both teams listened to it over the radio. My father, home in Virginia, listened to the game at a “listening party” with other Auburn fans. When the signal was lost, one of the members called a family member in Alabama and had them hold the phone up to the radio that they were listening to that day. Long distance wasn’t cheap in 1993 but it didn’t matter. After the game, I ran to Toomer’s Corner to roll the Oaks in fine tradition (a tradition that was forced to evolve). After about half an hour, as the adrenaline wore off, I stopped screaming and celebrating and realized that I didn’t feel so good. I walked the mile home and was sick in bed for the next two days. I didn’t care because we had won. So how does this tie back to thankfulness? Let me tell you some of what I am thankful for this week. The friends that I have made while watching and celebrating Auburn’s football team over the years. However we may disagree on many issues, we unite around the Iron Bowl. My parents, and other family members, who attended Auburn. They didn’t do anything to persuade me to attend. They allowed my natural inclination take hold. Content Management for providing a wealth of chaos to be solved. It sounds strange, but trying to solve this problem has paid many bills and bought many tickets over the years. I am thankful for the Passion of the Iron Bowl. That passion is always simmering inside of me and I dip into it on a daily basis. I’ve learned that many things can be accomplished if enough effort and belief are focused into the task. I want to leave with one parting thought. Life is crazy. The Content Management industry is crazy. It is important to have roots that you can depend on for stability. Things that will be there every year. Win or lose, the Iron Bowl, and Auburn football, is one of the Rites of Fall. No matter the other changes in life, it is there and I revel in it every day.